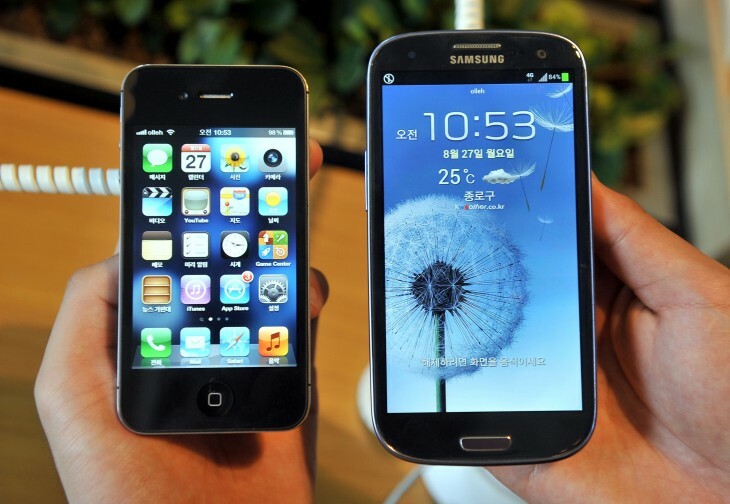 Android and iOS accounted for 96.4 percent of all smartphone shipments in Q2 2014, leaving even less for the competition as the Google-Apple duopoly hit a new high. Android grew its share to 84.7 market share, while iOS fell to 11.7 percent, Windows Phone slipped to 2.5 percent, and BlackBerry tanked to 0.5 percent. Google’s mobile operating system remains the clear leader this year, with Android reaching a new record for market share during Q2 2014 (up 5.1 points from 79.6 percent in Q2 2013) and nearly doubling its share in just three years. This is largely thanks to Samsung, which accounted for 29.3 percent of all Android-powered shipments, although that’s a figure that has been falling as competitors including Coolpad, Huawei, Lenovo, LG, Xiaomi, and ZTE grow their respective volumes. Apple’s mobile operating system meanwhile is slowly on its way back to single digits (down 1.3 points from 13.0 percent in Q2 2013), unless the arrival of large-screen iPhones tip the scales. If history is any indication, iOS will see a rebound in the third quarter as volumes receive a boost from shipments of new devices at the end of the quarter. 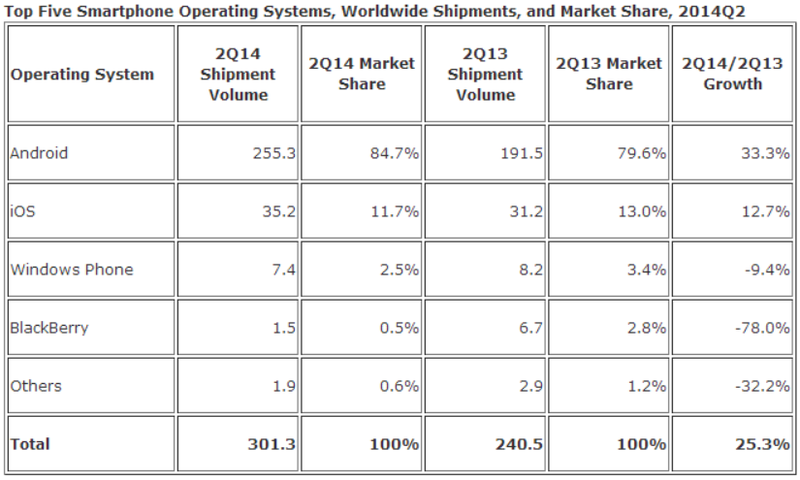 The remaining percentage points were left to Microsoft and BlackBerry. Windows Phone volumes declined from a year ago (down 0.9 points from 3.4 percent in Q2 2013), but were slightly up compared to the previous quarter. The list of OEM partners is expected to grow in the second half of 2014, with vendors coming on board in key emerging markets: BLU, Micromax, Prestigio, Yezz, and so on. Following three consecutive quarters of sequential decline, BlackBerry volumes rebounded slightly from the previous quarter, but that growth barely registers. Unfortunately for consumers, right now it looks very unlikely a competitor will be able to break the Android-iOS duopoly in the smartphone market.